A new love letter has been written, this one to an entire family and its American ancestors, replete with stories and new songs: Jeni & Billy’s new CD Heart of the Mountain, 200 Years of An Appalachian Family. I’ve written before in these pages about the work of the Nashville-based Appalachian duo Jeni & Billy. This new entry in their catalogue released this spring is a concept piece, an historical retrospective of family history with songs written to celebrate a few generations of lives and events. The twenty-seven tracks contain both spoken word and music, illuminating the 200 year history of the Smith family in Virginia. As a composer and author, Jeni Hankins has, over the lifetime of her writing career, typically worked her family history into a seamless stream of character-driven stories and songs that are presented on recordings and in live performance as an authentically front-porch type of “here’s a story and my song to go with it.” Each family remembrance or community tale inspires the song, presented with an old-fashioned, down-home folksy charm that is key to making the unique experience that this duo brings to audiences. 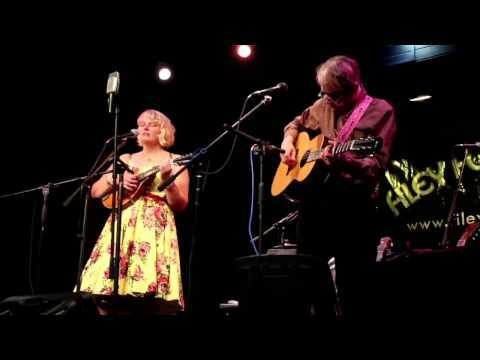 It’s an ancient tradition for storytellers to put a true-life happening into song (it’s the true oral tradition of folk music down through the millennia), and Jeni & Billy are carrying on this great tradition into our modern world. Often a humorist in her story-telling, this time Jeni has parceled out the spoken word to various family voices on this recording. You will hear her Mother and Dad, sister, grandmother and others, recounting events and characters from the past. The package for this album is quite the memory book, with full lyrics and production credits in a lovely booklet accompanied by Jeni’s original artwork sketches, along with a mockup of a faux newspaper page, fitted out as The Maiden Spring Bee dated May 1, 2016. This two-sided insert page includes columns one might see in any small town newspaper, but these are distinctly tied to the stories and songs on the album. Headlines include “Tazewell Justice Slain” with a vintage photo, caption “Squire John Rufus Smith,” “Mine Workers To Dedicate Union Hall,” “Posse Trails Killer” and “Life In the Jewell Ridge Coal Camp” among others. Within each column is a reference to the section of the album where this story can be heard, either sung about or told about via spoken word. This newspaper piece offers a fuller backstory for the listener, and is a great visual souvenir of the songs themselves. As I said earlier, the family itself is put into service on the spoken word sections, and the vintage recordings of Narcie Smith and Mawmaw Ann are particularly sweet. In her liner notes, Jeni writes that these “sound documents” are her “offering” to her ancestors. She easily captures, in her lyric writing and prose writing, the offhand combination found so easily in a country life of the ordinary and the prosaic side by side, finding the art and transcendence in the poetry of daily life in the mountains. The 27 tracks go back and forth between spoken word segments, songs and “tunes” which act as un-sung, brief musical interludes between full songs and stories. This recording does veer from Jeni’s usual choice of telling the stories herself before all the songs: this time, she lets her family do much of the talking. Jeni and Billy share writing credits on the songs, many of which make me think of Carter Family classics. I would venture to say with certainty that if these songs existed in the early 20th century and A.P. Carter was roaming the hills to collect songs as he did and found these, they would have become part of the original Carter family repertoire. Many of them are based on classic country and old time structures, with some venturing into later models (more on that below). that won’t be coming back again. and the humming just won’t stop. That silver hammer keeps on pumping. It don’t mind what it’s done. It never knew the silence. It only knows the hum. but she sees Jim Reeves all the time….. Girl, it’s just like the Mormons told me. the blue side of lonesome again. A favorite song of mine is one that could have been on a Patsy Cline album, Nothing Left to Say. It puts you in mind of the classic waltz breakup songs of the Grand Ole Opry in decades past. And Billy Kemp burns up the solo on his National Resophonic guitar. I will see him there by and by. I will marry him in the spring. Now a word about the players: Billy Kemp has for years now been proving his very fine skills in accompanying, both with instrument and voice, sensitively bringing the greatest musical potential out of these songs, and he does so again on this album, with impressive virtuosity. Besides vocals, he accompanies on Resonator Guitar, Appalachian Dulcimer, piano, banjo, bodhrán, harmonica, melodica, acoustic bass, percussion, electric guitar, electric bass and organ. Craig Eastman adds wonderful fiddle to many tracks, Ed Hicken is a great pedal steel (The Roses of California), and Jeni handles lead vocals and guitar. Other players are Neil Inndes on double bass, Mark Walker, trap set, Lisa Mallaghan on vocals, Ira Gitlin, banjo, and Karen Collins on vocals. The song Guaranteed to Sail lists an additional writer joining Jeni and Billy, Alfred Hickling. During and after a good hearing of this great new CD project, you’ll feel like you’ve spent a good long visit in the mountains with this family, remembering the generations, and that they’re all new friends of yours. Very special note will be taken here, by this family remembrance piece, of the tragic loss of Greg Hankins, Jeni’s father, on July 24 of this year. Greg was a very large part of the career of this duo and will be greatly missed by all who knew him. Find the album and more information at their website.